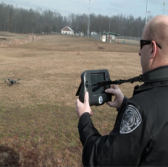 Sheriff’s agencies in New Jersey and Virginia have begun to deploy a Lockheed Martin-built quadrotor unmanned aircraft system designed to facilitate search-and-rescue missions as part of a program that seeks to find missing individuals with special needs. Lockheed’s Indago small UAS is integrated with an electronic equipment from Project Lifesaver International to help first responders locate missing persons with dementia, autism or Down syndrome, Lockheed said Wednesday. The Somerset County sheriff’s office in New Jersey has become the first law enforcement agency to use the Indago system and has 40 individuals at risk for wandering who are enrolled in the project. Rich Bonnett, Indago program manager at Lockheed’s unmanned systems business, said the combination of Indago and PLI’s components seeks to increase signal detectability, facilitate aerial relay and boost efforts to locate individuals across wide search areas. Indago is a 5-pound collapsible platform that has an electro-optic infrared imaging tool and is designed to fly for at least 45 minutes to perform disaster relief, firefighting, agriculture and coastal erosion tracking operations.